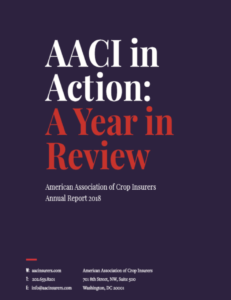 San Diego, CA – The American Association of Crop Insurers (AACI) released a report titled “AACI in Action: A Year in Review.” The report highlighted its important advocacy efforts over the last year, including policy victories such as the bipartisan enactment of the 2018 Farm Bill with a strong crop insurance title. It was another record year in 2018 with more than 334 million acres of farmland covered by crop insurance This was a 20 million-acre increase over 2017. Crop insurance came in $2 billion under federal budget projections for the 2014 farm bill. Improper payment rates declined again, dropping from 1.96 percent in 2017 to 1.81 percent in fiscal 2018. The 2018 loss ratio is projected to be 0.58, as of Feb. 4, 2019. It is slightly above the 2017 loss ratio of 0.53, but below the 2012 drought year’s loss ratio of 1.57.